On this cycle tour from Vietnam to Cambodia you'll feel like a time traveler as you relive many periods of history from the 4th century ruins of My Son to the 10th century Khmer Empire all the way through to present day. As we ride between three UNESCO World Heritage sites you'll also be regaled by unforgettable scenery, ranging from long coastal roads, to coffee plantations covering the highlands, to golden sunsets on the Mekong River. Riding along the Vietnamese coastline we visit the UNESCO World Heritage sites of Hoi An, Southeast Asia’s major trading ports during the 17th and 18th centuries, and My Son, the ancient centre of the Cham civilization. We stop at My Lai for a somber tour of one of the worst massacres of the American/Vietnam War, then head into the central highlands, riding through scenic countryside before reaching Pleiku, home of the best coffee in Vietnam. The next day we cross the border to Cambodia to explore the local Khmer life. Take a cruise on the Mekong River to see the endangered Irrawaddy dolphins and ride through the picturesque town of Siem Reap which hosts the magnificent temple sites of the Angkor Wat complex. We meet in the charming town of Hoi An, which was one of Southeast Asia's major trading ports during the 17th and 18th centuries, for a welcome dinner and trip briefing. We ride to see My Son, the ancient centre of the Cham civilization. Although many of the temples were destroyed during the war, there is still enough to impress most visitors. We transfer from Hoi An toward Quang Ngai and begin our ride from a small village. The road is shaded by arching palm trees and surrounded by tended rice paddies. We stop at the infamous My Lai, site of one of the worst massacres of the American/Vietnam War. We leave the coast and head into the central highlands towards Quang Nam and on to Kon Tum. We have a pass to conquer today, Viloluk Pass (1000 m above sea level) but then are rewarded with a 20-km descent. We cycle through Jarai and Bhanar villages and see communal houses with very steep and tall roofs. Next, we enter tea and coffee plantations before reaching Pleiku, home of the best coffee in Vietnam. After breakfast, we head to the border with Cambodia. Start riding to Banlung, one of the most far-flung of the Khmer provincial capitals and spend the night in rustic surroundings. Day of relaxation to enjoy a morning market or take a picnic lunch and explore the mysterious crater lake of Boneng Yeak Laom or just enjoy staying at the lodge where we meet up for dinner. Get back in the saddle to Stung Treng province along a rustic highway. Ride through rice paddies and stop to enjoy the simple pleasures of rural life as we cycle towards the setting sun. Tonight, experience delicious Khmer food paired with very personalised service at Tonle Tourism Training Centre. 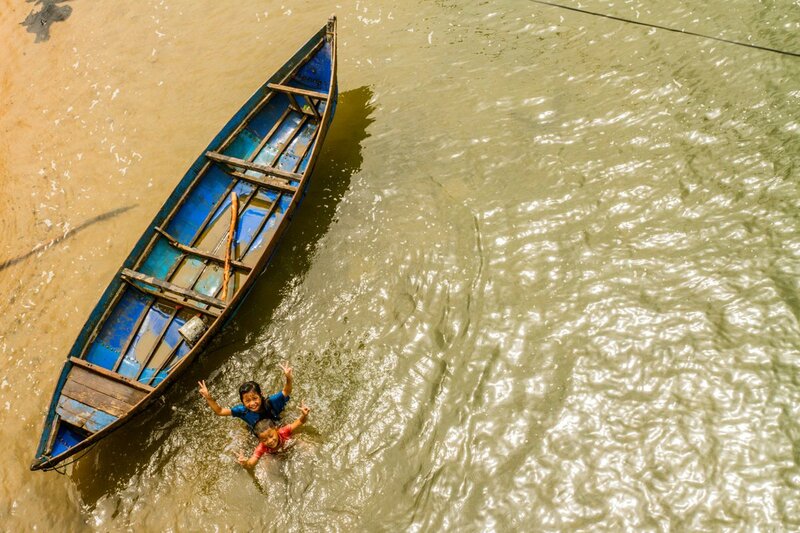 We cycle through rural villages then board a boat at Kratie to enjoy an afternoon cruise on the Mekong River to see the endangered Irrawaddy dolphins. At night, enjoy views of the Mekong from the rooftop terrace of your hotel. We take a ferry across the Mekong to Chhlong and ride pass French colonial houses and Buddhist pagodas. Then cycle up to Wat Han Chey, an 8th century pre-Angkor temple, to enjoy a picnic lunch and stunning views of the Mekong. We ride over dirt and tarmac roads along the Mekong to Kampong Thom, a picturesque town on the banks of the Stung Saen River, which hosts a magnificent Khmer temple site. We transfer to the ancient bridge at Kampong. Later, ride to Domdel vil-lage and transfer to Siem Reap to our overnight hotel. We start our ride to the Angkor Wat complex to see the biggest religious Hindu edifice in the world. We also visit Tah Prohm, famous from the film “Tomb Raider”. We continue to Angkor Thom and Bayon Temple, ending our day with a beautiful sunset in the Angkor Park. The morning is free until we transfer you to the airport. Day 2 - Hoi An - My Son - Hoi An Ride 54km. +757m / -734m. This is our second adventure with SpiceRoads in SE Asia and they did not disappoint. The guides and support team do their best to make the experience as extraordinary as possible - the culture, food and support throughout the trip is always remarkable. A fantastic way to see the country and experience the local culture and food. The guides are truly incredible and look after you so well and you get to meet people and enjoy experiences along the way. I would just like to reiterate how much we enjoyed the guides on this tour, Mr Thang was very knowledgeable and the food was incredible and Phea and Nan made an excellent team and made the whole experience so enjoyable - with their attention to detail and their funny personalities - I would definitely recommend a tour to anybody who asked. Please pass on our appreciation to Thang and Phea - they certainly made our experience a great one. I have completed about 25 tours with SpiceRoads and wanted to give a shout out about this excellent guide of yours. He is a great leader in training the other members of his team, an excellent rider and a truly nice guy as well. You should be very proud to have guides the calibre of Anh Co representing your company. All of our group are raving fans of his. 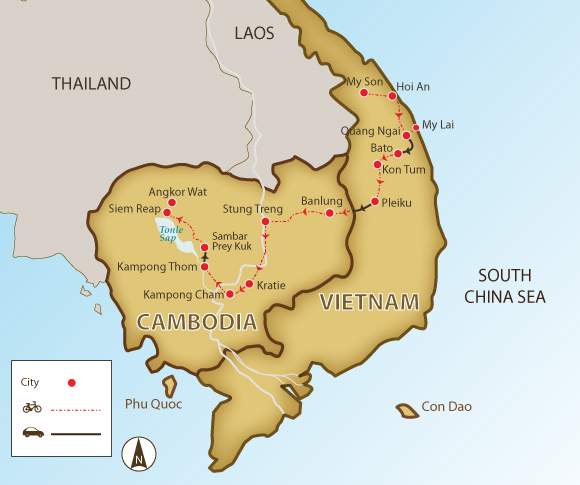 Our biking adventure takes us from the coast of Vietnam through the central highlands to the heart of Cambodia. We cycle approximately 791 km in 11 cycling days, with lots of time sightseeing and exploring the countryside. The cycling is on a mixture of well-surfaced roads and good quality dirt tracks. Some of the days are quite long, and experienced riders usually find it sufficiently challenging. Faster cyclists can ride at their own pace after consulting the guides on the route. However, the average rider will want to ride and take photographs, stopping here and there to take in the magnificent sites. If you race through the countryside, you'll be missing out. The terrain is varied from flat days to hilly and undulating days. We do have a few days where we cover longer distances, but these are mostly on flat terrain, and the kilometres will speed by. Experienced riders will find the distances long enough to challenge them, while less experienced riders are easily able to travel at a more relaxed pace. Suitability: This trip is suitable for anyone with a reasonable level of fitness. This trip is mildly challenging, so the more time you have spent in the saddle and the fitter you are, the more you will enjoy it. Biking Conditions: This trip is mainly on good quality tarmac roads and some vehicle-width dirt roads. No off-road riding experience is required. A support truck is always available to help when required, and participants can cycle as much or as little as they like and still enjoy the same views as the rest of the group. We meet in the charming town of Hoi An, which was one of Southeast Asia’s major trading ports during the 17th and 18th centuries. An important point of call for Chinese, Japanese, and Portuguese traders, the architecture reflects its cosmopolitan past. More than anywhere in Vietnam, Hoi An retains the feel of the past and is now protected as a UNESCO World Heritage Site with more than 844 structures of historical significance. It is a fantastic place to spend the day wandering the narrow streets and rubbing shoulders with the locals. We meet for a welcome dinner and trip briefing. An easy start to riding with a visit to another World Heritage Site. After a short transfer to avoid busy H1, we ride to see My Son, the ancient centre of the Cham civilization. We cycle along scenic country back roads, past rice paddy fields, through a eucalyptus forest, and pass many scenic villages. The road eventually climbs away from the coast, offering stunning views, and then turns into rough gravel as we move into an increasingly more remote region. This 14-km road cuts a gorge through the lush jungle alongside the Song Tranh River and eventually leads us to My Son, which was once Champa’s greatest city. Although many temples were destroyed during the war, there is still enough of the archaeological site to impress most visitors. We take lunch before spending the afternoon visiting the site. In the afternoon, we transfer by bus back to Hoi An. Dinner is on your own to choose from Hoi An's many fantastic restaurants. This morning, we transfer from Hoi An toward Quang Ngai and begin our ride from a small village. The road is shaded by arching palm trees and surrounded by tended rice paddies. By lunch, we arrive at My Lai, the site of one of the worst massacres of the American/Vietnam War and take a sobering guided tour of the site and museum. The cycling continues out into the Vietnamese countryside where we stop to visit a traditional pagoda before heading to our hotel in town. Today is more challenging as we leave the coast and head into the central highlands towards Quang Nam and on to Kon Tum. We cycle only part of today, along undulating roads through thick pine forests with stunning photo opportunities. We transfer about 2 hours to the town of Bato in the highlands and cycle 15 km uphill to the top of Viloluk Pass (1000 m above sea level) and the brand-new town of Mangden. This is an incredible experience, followed by a 20-km descent to the bottom of the pass. From here, the route undulates past many remote villages, tropical forests, over bridges, and along quiet and scenic roads. After breakfast, we ride out into the countryside to visit some local villages of the Jarai and Bhanar ethnic minorities. These tribes still practice animism, believing that demons inhabit all of creation. The area is well known for their communal houses with very steep and tall roofs. Each village takes great pride in these unique designs as they define the regional landscape. After a local lunch, we pedal to the Pleiku, home of the best coffee in Vietnam. This is an easier day, and you will notice the change in scenery as you cycle through a wide valley surrounded by mountains, punctuated by tea and coffee plantations along the route. A two-hour transfer by car after breakfast takes you to the border with Cambodia. At this point, it is time to say goodbye to the Vietnamese team. After the immigration formalities at the Le Thanh border checkpoint, our team will be waiting for you on the Cambodia side. We start our ride from the O Yadao border to Banlung in Ratanakiri. Banlung is one of the most remote of the Khmer provincial capitals. We spend the night in the surroundings of Terres Rouge, a traditional Khmer-style house oozing with old world charm in this remote part of Cambodia. Wake this morning to a well-deserved day of rest and relaxation. The day is yours to do as you wish. For the early bird, there is the early morning market buzzing with merchants of every description hawking their wares. Take a picnic lunch and explore the mysterious crater lake of Boneng Yeak Laom, believed to be the home of water demons and is so deep, its bottom has never been touched. Or just stay and enjoy the lodge, where we meet up for dinner beneath the stars. After a day of rest, it's time to get back in the saddle. In the morning, we set out on our cycle to Stung Treng province along a tarmac highway. On route, you can expect to see true rural Cambodia. Rice paddies and rubber tree plantations roll away from the raised road as the flat expanse of the landscape is met by electric blue skies. We stop to enjoy the simple pleasures of rural life in Rattanakiri. Making our way into Steung Treng, we are welcomed by the shade of lush green plantations lining the road as we cycle towards the setting sun. Tonight, experience a special dinner at Le Tonlé Tourism Training Centre, where young locals are being trained in hospitality to ensure a better future in Stung Treng. Dining here means most delicious Khmer food paired with a very personalised service. The students are as excited to meet their guests as the guests are to meet the students. We rise early for our breakfast in town. We have a long day of riding ahead of us, towards Kratie, a small provincial capital located right on the Mekong River. This place is primarily known for the endangered Irrawaddy dolphins, whose largest population can be found here, near Kratie. After a short morning transfer, we set the bikes down and begin cycling through rural villages. After a while, we pick up the bikes for another short transfer to the junction between the new National Road 7 and the old. Here, we need to watch out for playing kids, chickens, cows, dogs, ducks, and oxen. Just before we arrive in Kratie, we board a boat and enjoy an afternoon cruise on the Mekong to see the Irrawaddy dolphins. We transfer to the hotel where you can enjoy views of the Mekong from the rooftop terrace of your hotel. We transfer south through the town of Chhlong and take a ferry to the western bank of the Mekong to start riding from Phnom Han Chey on quiet roads along the river, through small rural villages and scenic countryside. We stop for a drink and snack at the tiny town of Chhlong. The many French colonial houses in this town are among the most beautiful in Cambodia. It is a scenic ride as we pass many Cham communities, which are predominantly Muslim. Buddhist pagodas form a pretty contrast with small mosques, and the particularly friendly locals will welcome you warmly in each village you pass. We cycle up to Wat Han Chey, a small hilltop pagoda that houses an 8th century pre-Angkor temple and offers spectacular views over the Mekong. Here, we enjoy a well-deserved picnic lunch complimented by sweeping views of the Mekong. Then, we cycle the last 22 km to Kampong Cham, where you can relax at the hotel. We leave Kampong Cham over dirt and tarmac roads along the Mekong and eventually head for a quiet secondary highway towards Kampong Thom. You will be flanked by rubber plantations, paddy fields, and typical Khmer villages on today’s ride. Kampong Thom is on the banks of the Stung Saen River, and is a good base to visit the wooded Khmer temple site, Sambor Prei Kuk. We avoid some of the poorer roads in Siem Reap by transferring 85 km for one and half hours to an ancient bridge at Kampong Kdei, one of the best examples of the remaining 800-year-old bridges in Cambodia. Continue to transfer another 31 km to Domdek village where the team and bike are ready for you to start your 66-km challenge on back roads through the historic highway connecting the province of Kampong Thom and Angkor Wat. We stop and have lunch in local restaurant. After lunch, we continue our challenge to celebrate when we finish our cycle for today, located a short distance from the Western Gate of Angkor Wat. Tonight, enjoy a celebratory Khmer dinner at Viroth's, a stylish and comfortable restaurant set in a quiet garden. This morning, we start our bike ride to the entrance of the Angkor temple complex. We enter from the south and traverse up portions of tarmac road and jungle paths until we reach our first temple of today, Tah Prohm. After our visit, we carry on through the jungle and toward the eastern gate of Angkor Thom, ancient capital of the Khmer Empire. Near the centre of this massive enclosure, we'll find the enigmatic temple of Bayon. This temple is known for its many smiling faces. As the sun reaches its zenith, we take a short rest and lunch, before visiting the grandest temple of them all, Angkor Wat. Depending upon the time, we can choose to return to Siem Reap after our visit, for a brief rest before returning to the Angkor complex. This evening, we'll enjoy a beautiful sunset in the Angkor Park and return to our hotel by transfer. You are free in the morning until we transfer you to the airport.